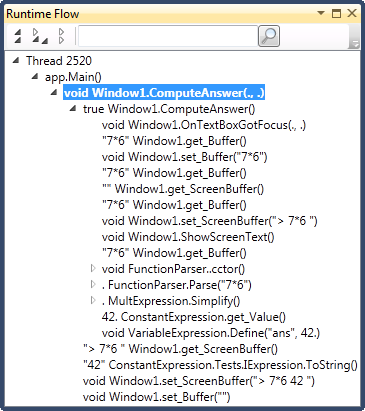 Inherited a very complex .NET codebase and want to understand the flow in detail? The code contains a lot of delegates making debugging a nightmare? 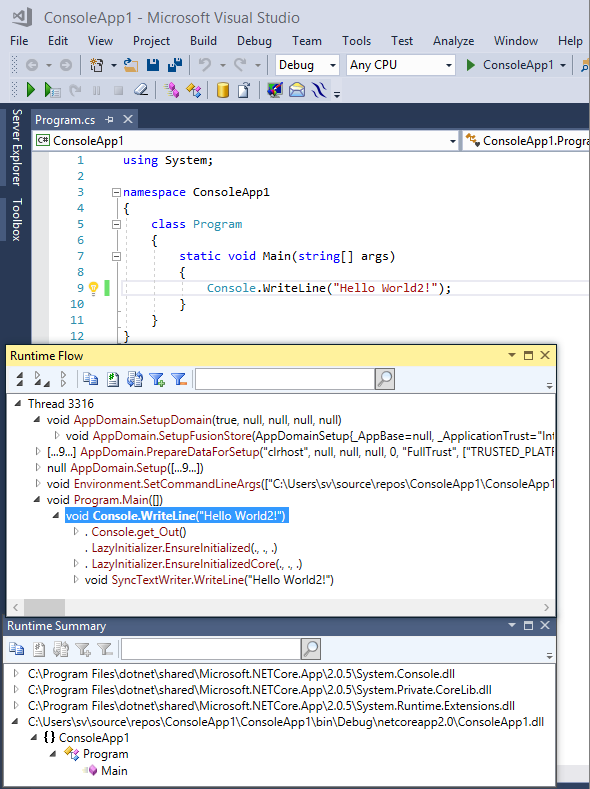 Runtime Flow can help you get started pinpointing specific code areas that are responsible for the selected use case. Have .NET controls with numerous events? Want to know which of these events are being fired and when? Runtime Flow shows you the sequence of all method calls. Using a 3rd party .NET library? Having a problem making it work correctly? Runtime Flow can show what happens inside the library without the source code. Tired to verify lines of code being executed by setting break points and adding trace statements? Runtime Flow can show you all function calls without additional instrumentation. A program crashes and suddenly exits without any errors? Runtime Flow can show the last function calls before the crash. Want to log with what parameters a function was called? Runtime Flow shows and logs simple function parameters and return values without additional instrumentation. To monitor an ASP.NET application running in IIS see Monitoring a web application in IIS 10. The portable edition can work without Visual Studio and almost without installation. 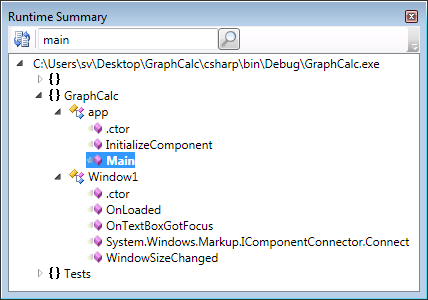 You only need to register a profiler COM class before running RuntimeFlowPortable.exe. 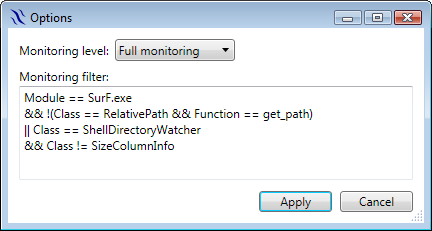 If you don't have admin rights and you only need to monitor applications under the current account, run Register profiler for the current user.cmd. If you have admin rights, it is recommended to run Register profiler for the local machine.cmd. When no longer needed, you can unregister the profiler with the appropriate Unregister script. The portable edition includes the RFShortcuts extension that registers two global Windows shortcuts Win+F11 and Win+F12 to resume and pause monitoring. It allows you quickly pause and resume monitoring without switching from the monitored application. Function calls are displayed in the tree with threads as roots (including thread names if present, assigned for example using the System.Threading.Thread.CurrentThread.Name property). Repeated function calls are shown as dup with repetition count. Repeated calls of a group of functions are shown as mdup. For duplicate function calls the first and the last call's parameters and return values are displayed. Function parameters and return values of complex types are displayed as dots. Strings longer than 260 characters are trimmed to not overrun the screen. When number of elements in an array is more than 10, the first nine elements are displayed + number of skipped element + the last element. When an exception occurs the function return value is displayed as Ex with thrown object information. The Clear command on the Runtime Flow toolbar removes all functions except currently executing ones and removes finished threads. The Expand command expands the whole tree one level further, the Expand below command expands nodes for the selected function further and the Collapse command collapses the whole tree one level up. The search field allows you to search for classes, functions, parameters and return values. The Runtime Summary window lists all classes and functions that were used during a program run organized by modules and namespaces. All elements are alphabetically sorted. New functions are added in real time and removed by the Clear command the same way as in the Runtime Flow window. The search field allows you to search for namespaces, classes and functions. Each new search continues from the selected node. The Locate in flow toolbar button finds the selected class or function in the Runtime Flow window. Press the Locate in flow button again to find the next occurrence. Full monitoring monitors each function call. Summary only detects only the first function usage - the Runtime Flow window is empty in this mode and the Runtime Summary window shows almost the same content as in the full monitoring mode except for the Clear command usage. In the Full monitoring mode, after clearing the events, each function call adds a function to the summary window. In the Summary only mode, only functions that were never used before will be added to the summary window when called. Summary only monitoring is very fast and well suited for an application reconnaissance with the empty monitoring filter. Filtering out unneeded functions improves monitoring performance and simplifies monitoring log. It's possible to filter by module, class and function creating very specific boolean expressions. The monitoring filter is applied at the beginning of a monitoring session. You can use == and != between Module, Class, Function and a filter string. If the filter string contains spaces or special characters it should be quoted: Module == "C:\Program Files\SurF.exe". The empty filter sets monitoring for all modules, classes and functions. You can use the ! unary operator to negate expression and ||, && for OR and AND operations. A filter string allows tail matching after delimiter. Thus Module == SurF.exe matches "C:\Program Files\SurF.exe", but not "C:\Program Files\OverSurF.exe". During matching, class name contains its namespace: Class == FileSystemWatcher matches System.IO.FileSystemWatcher due to the tail matching. A filter string allows prefix matching by using * at the end: Module == C:\*. It also allows filtering by namespace: Class == System.IO.*. When monitoring a C++/CLR application, "native" functions are represented as the class <Module> and "native" class included in function name. Thus to exclude classes and functions in the std namespace use Function != std.*. true and false constants can be used to quickly enable or disable part of a filter. For example, adding || true at the end of a filter enables monitoring of all functions without deleting the whole filter expression. After you've started monitoring (with Run or Customized Run) and have executed a use case, you can press the Pause button on the Runtime Flow toolbar. Pause stops all updates to the Runtime Flow and Runtime Summary windows and eliminates most of monitoring overhead (speeding up the monitored application and limiting memory consumption). In this mode you can browse collected events and execute tasks in your application not required monitoring. When you are ready to run a next use case, press the Resume button. Resume clears the Runtime Flow and Runtime Summary windows and resumes normal monitoring events processing. You can save monitoring results (content of the Runtime Flow and Runtime Summary windows) to a .rdf file with the Save	button on the toolbar. This file can be later reopened with the corresponding Open button.